On Friday’s Mark Levin Show, Brian Mudd from WJNO fills in. 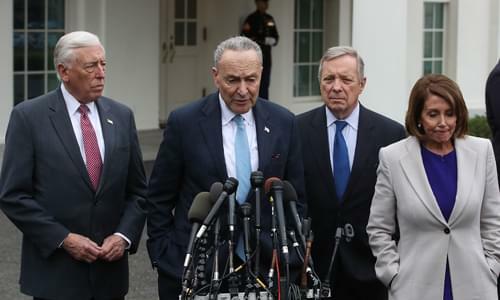 It’s Americans on the breadline, not a booming economy, at least that’s what you’d think if you listened to Sen Chuck Schumer. Yet we currently have the best economy in 13 years, record-low unemployment rates across multiple demographics. Later, there’s more that unites us than divides us sounds cliché but it’s true. Most of us want our children to be educated and successful in life, and we all want to be prosperous and safe. So we must ask ourselves are we willing to trade our current national successes in order to have the politician of our choice, even if it meant losing the gains in jobs? Then, we need to stop feeling entitled! When was the last a federal employee or the media was up in arms over Jane Doe being laid off from her private sector job or the shutdown of an American factory? This comes down to perception versus reality. The federal government positions themselves over our money as if we’re fortunate to keep what’s left after they tax us – this is nonsense because they don’t have any money, they take our money! The bottom line here is that we don’t need nearly as much government as we have. But we do need border security to continue to safeguard our country.